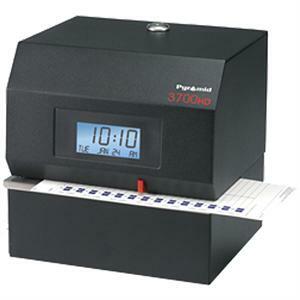 With a 1-minute setup, the Pyramid 3700HD Time Clock features durable steel construction for industrial or office settings. An excellent selection for document stamping, the 3700HD is capable of right or left hand printing. Record date and time (AM/PM, military or 100th of hour) on correspondence, incoming and outgoing documents, as well as 14 selectable messages all in 3 different languages (English, Spanish, & French). It's 30-day battery backup maintains setup and time in case of power failure and means there's no resetting required for short months, leap year, or daylight savings time. Dimensions: 8" x 8" x 7"